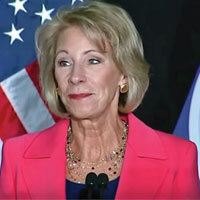 ORLANDO, FLA. – In response to reports on Wednesday that U.S. Secretary of Education Betsy DeVos is considering allowing federal funding to be used to purchase guns for teachers, the Florida Coalition to Prevent Gun Violence strongly opposes this dangerous and misguided proposal. “The solution to our nation’s gun violence problem does not and should not include adding more guns, especially in educational settings. At a time when public schools across the country are suffering from budget cuts, federal funds should be deployed to provide the best possible education for students rather than purchasing firearms,” said Andy Pelosi, co-chair of the Coalition. “Allowing faculty and staff to carry firearms can create a negative and disastrous environment for our children and staff,” Pelosi continued.